"Wings of the City," a series of bronze sculptures by Mexican artist Jorge Marín, are on display at the San Antonio Botanical Garden through June 6, 2016 presenting a special opportunity to view classic sculpture in the garden. 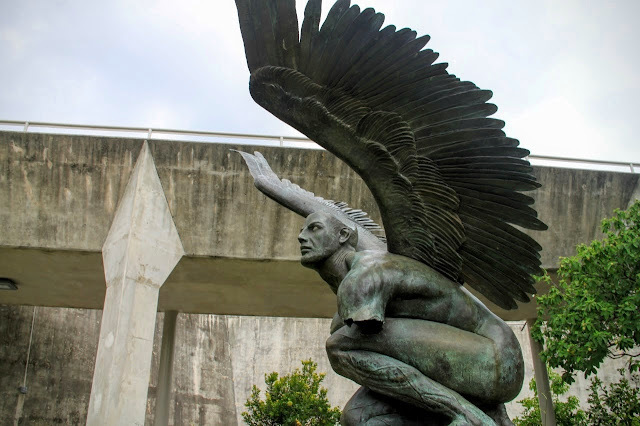 Designed as a traveling exhibition shown in cities around the world and sponsored by the Consulate of Mexico along with local businesses, I was thrilled to see eight of the sculptures in November. 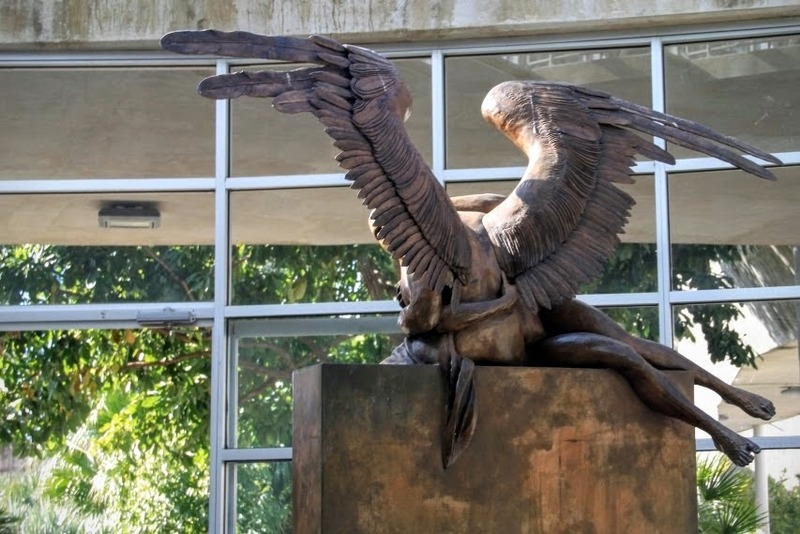 A ninth work from the series is on display at the Southwest School of Art. Angel Perselidas has just landed. Beaked masks are designed to encourage interaction according to the artist. 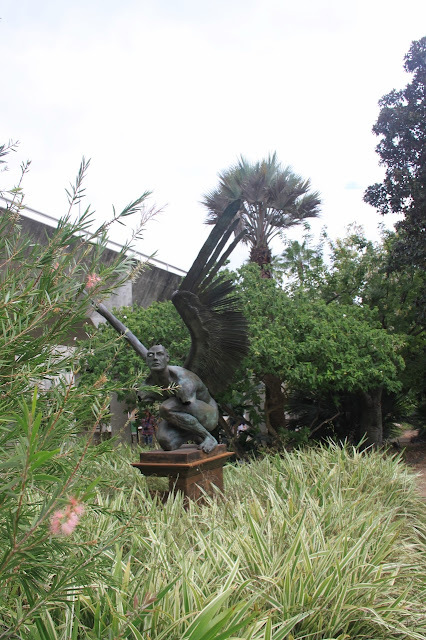 Marín's placement of the sculptures within the gardens and in context of surrounding structures was particularly compelling. 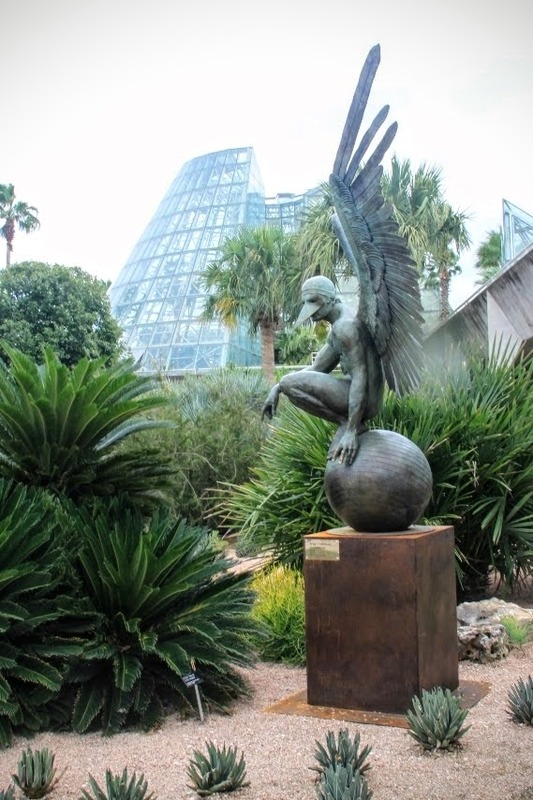 Cycads evoke the wing theme and are a good textural match for the sculpture. 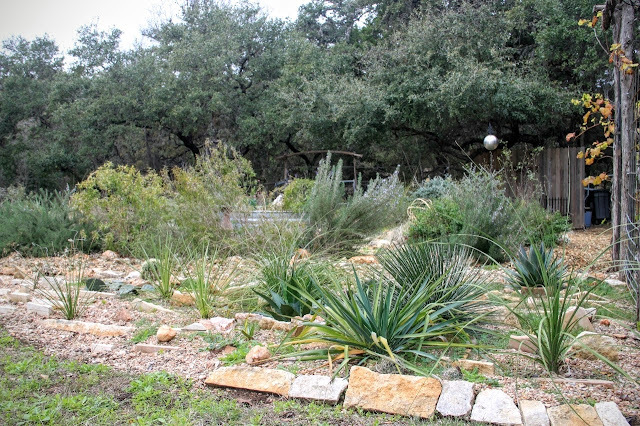 Agaves in the bed below make closeup viewing a challenge. 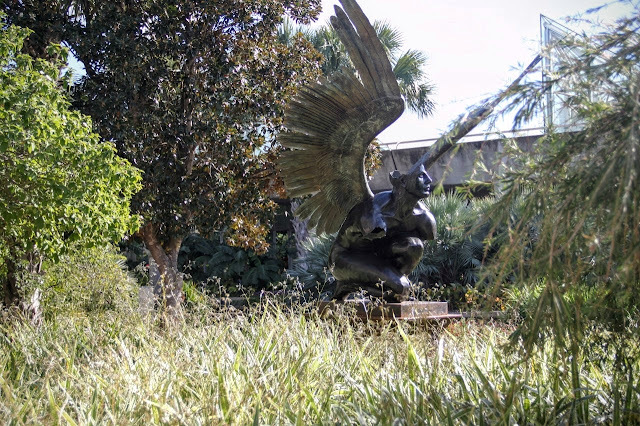 Tiempo crouches in the ornamental grasses with missing arms and partial skull. Wing details are exquisite. 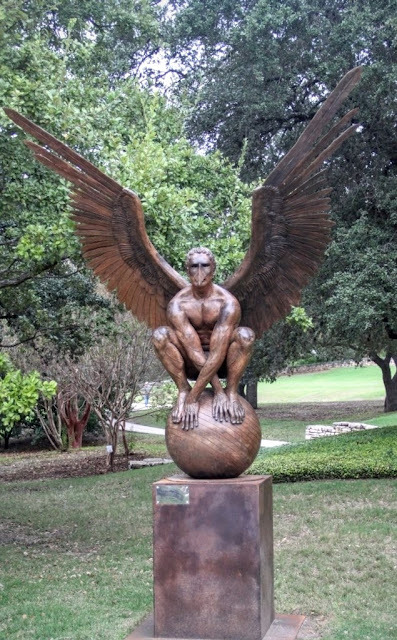 Marín began forming wings with modeling clay as a child and sculpted his first wings in art class at age 18. A bit battle weary still with intact wings, ready for action. Well sited among specimen plants. Wingless Split with angled legs reinforced by the form of surrounding buildings. 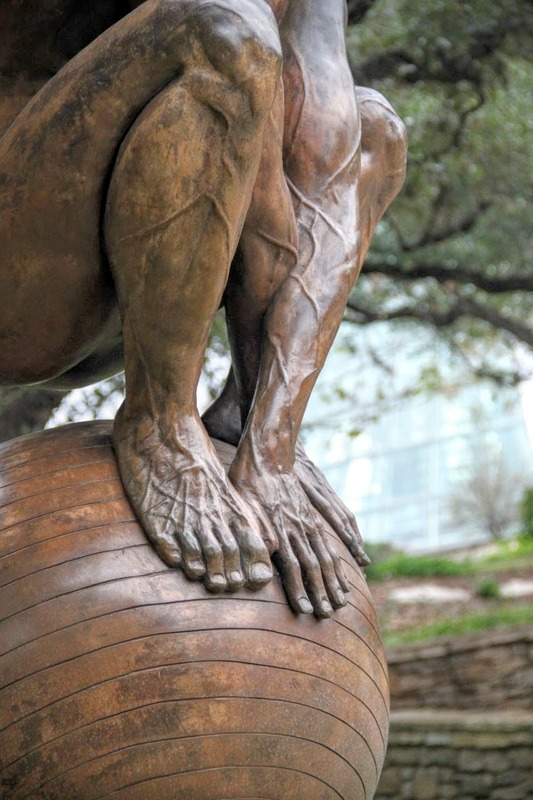 Archivaldo strikes a powerful pose. Details in relief evoke strength. 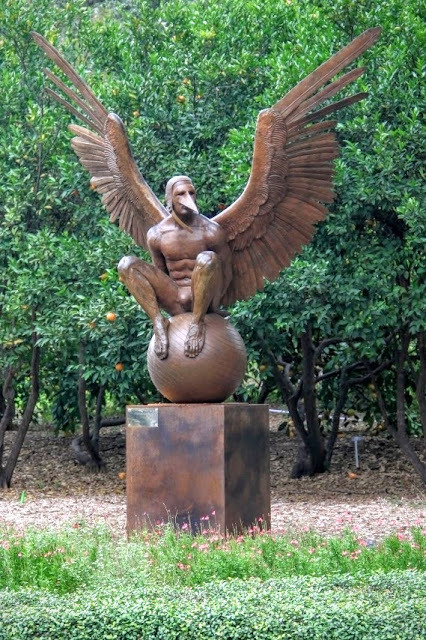 With an aviator's helmet and hands crossed behind Bernardo Oriental rests near a grove of ripening citrus. Overlooking the formal gardens emphasizes his classic lines. 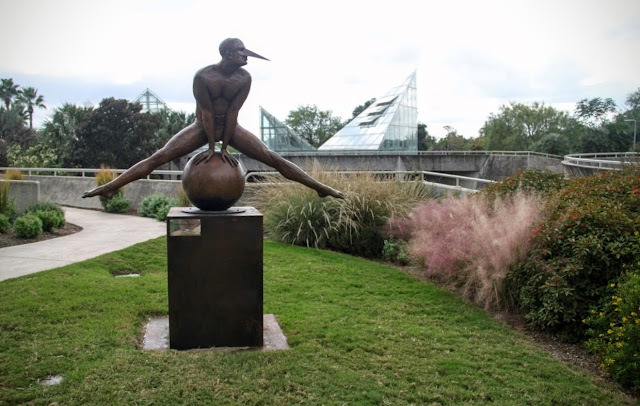 Photos from the exhibit in other cities show these pieces set against busy city scapes in contrast to this more restful garden setting. 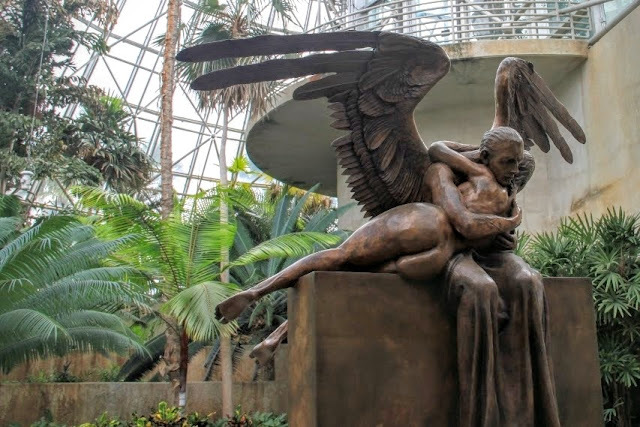 Set in the palm room, Embrazo, an angel comforting a woman Pieta style. It's the only sculpture in the exhibit displayed indoors. 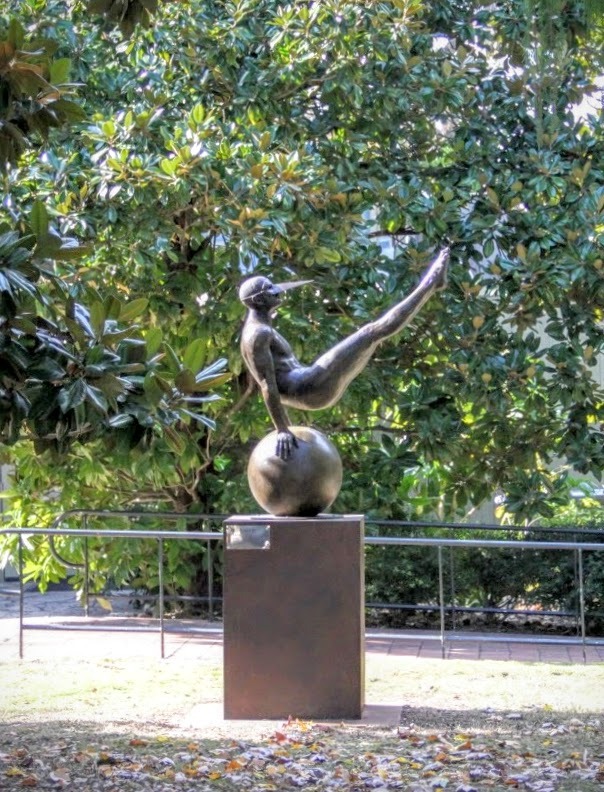 Equilibrista 90 evokes balance and strength in a magnolia grove. 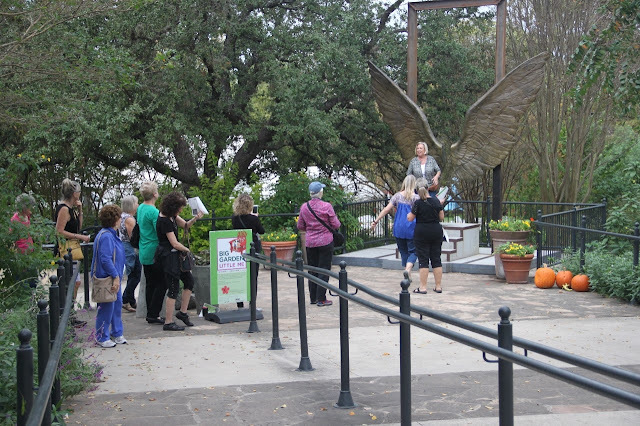 ...then quite dynamic moments later when my garden club friends encountered them. For a different perspective check out Pam's photos at Digging from the Houston stop on the tour. 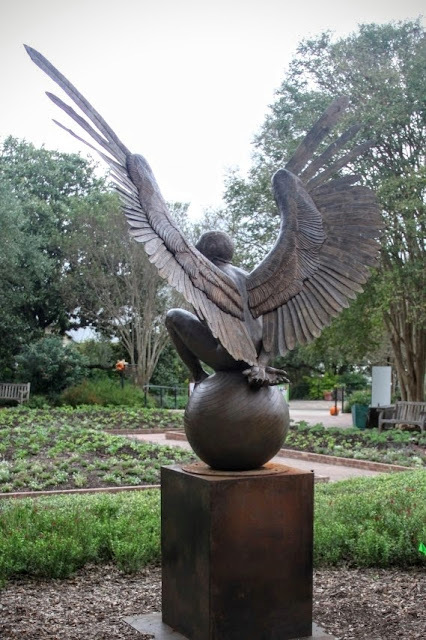 "Wings of the City" will be at the San Antonio Botanical Garden through June 6, 2016 so you have plenty of time to visit this spring for a view of art with the garden in bloom. 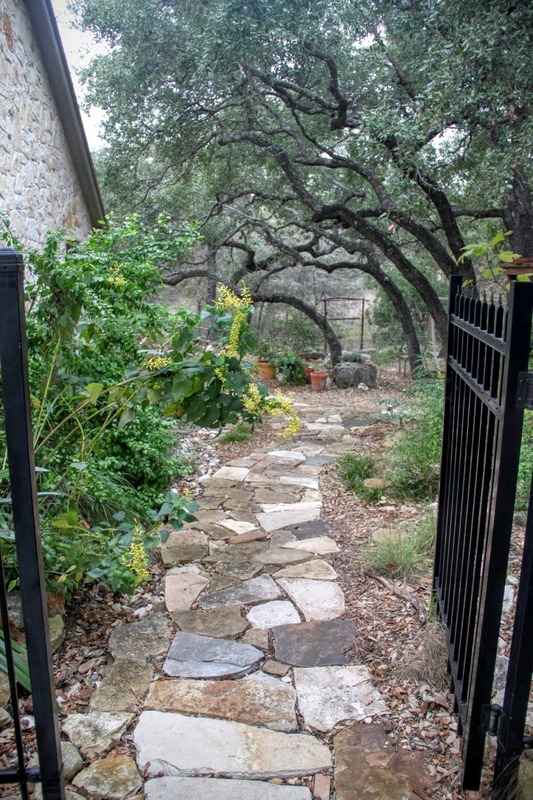 When my friend Heather at San Antonio Water System (SAWS) contacted me about writing a guest post for their website Garden Style San Antonio I didn't hesitate to say yes. 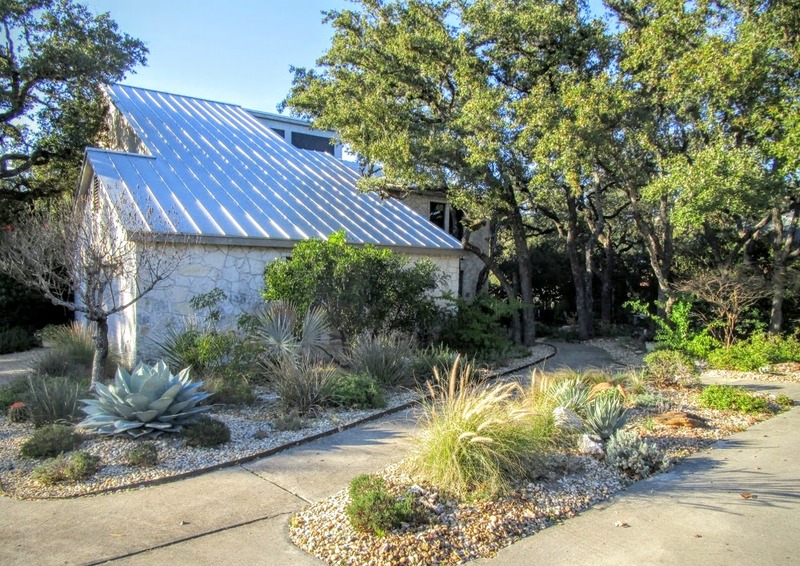 Garden Style San Antonio has been an an excellent resource for watersaving garden ideas and I'm excited to have my first guest post published on the site today. 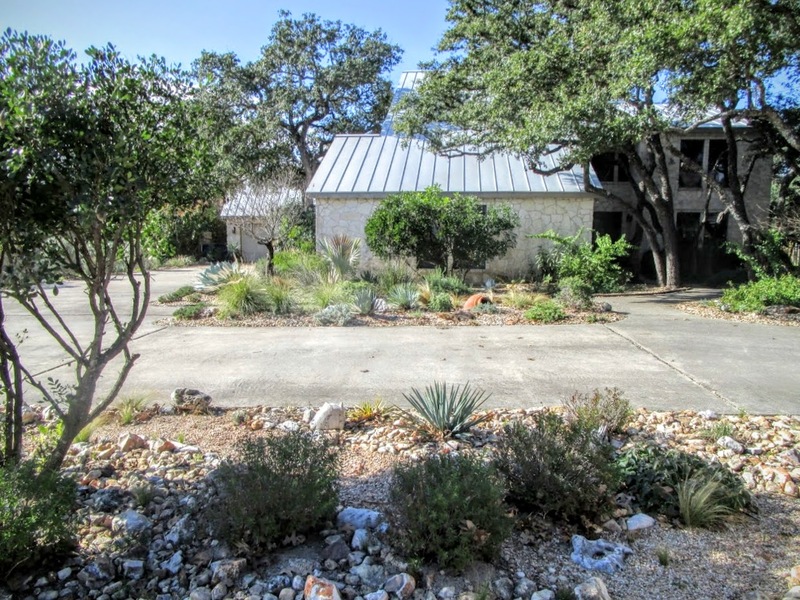 If you garden in San Antonio or Central Texas, you will enjoy browsing their extensive plant lists with photos, design ideas, seasonal reminders for tasks in the garden and the latest on SAWS watersaver coupons. Another reason I was happy to guest post for SAWS is my article highlights the stars of my winter garden--agaves, cacti, and succulents. Lawn is not the only welcoming option for a front yard, these plants have led to many compliments from passersby and opportunities to chat with neighbors over the years. Planned about six years ago with the idea that our front landscape would look much the same year round with minimal maintenance, we've achieved our goal. 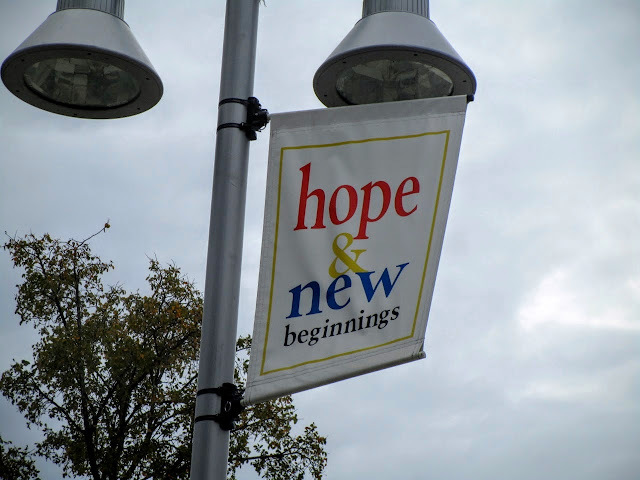 Mid-January is an excellent time to check out our plan. 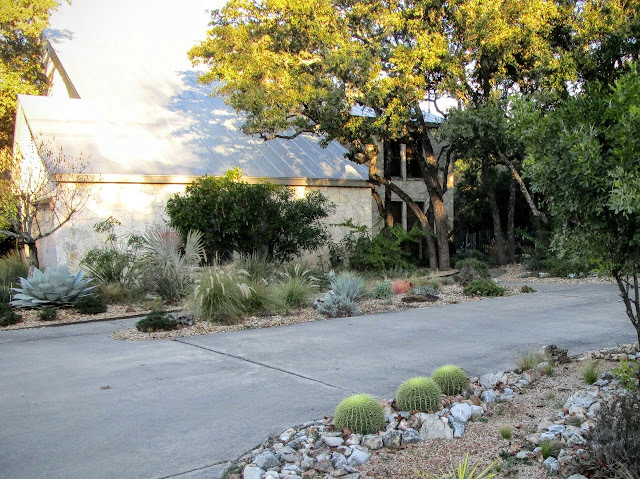 With a silvery foundation of drought-tough agaves, grasses, and evergreens like Texas Mountain Laurel, all anchored by native Live Oaks, the front garden needs only a few tweaks each year to keep it looking great. Any post highlighting agaves in my garden must begin with Agave Ovatifolia, the focal point of the front drive. 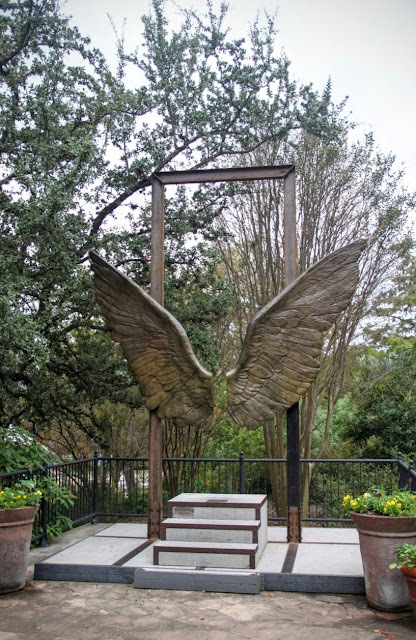 Heather knew I wouldn't turn down a chance to write about this beauty! Damianita at its feet have just finished blooming. 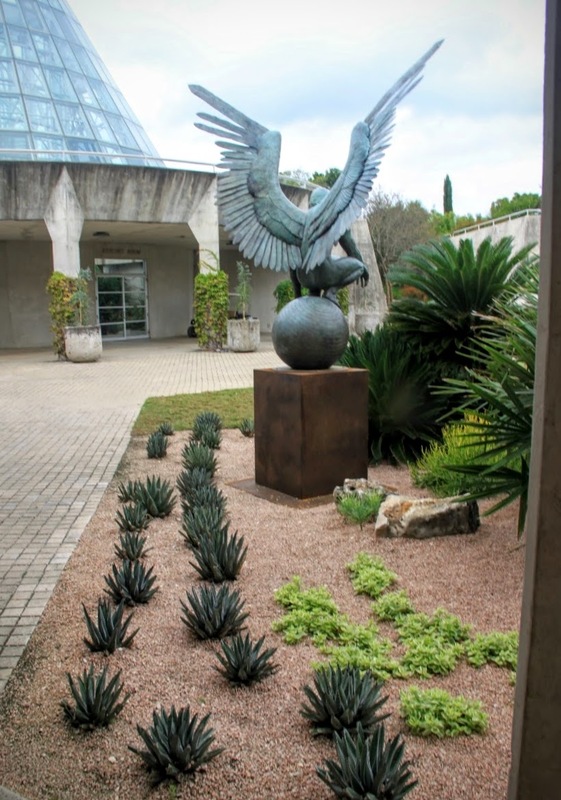 Upright and comparatively small Agave neomexicana provides a focal point in the narrow island. There are two offsets emerging and I can't wait to plant those out in the garden when they're ready. Tough agaves and yucca add form and structure while echoing the silvery color theme throughout the front garden. 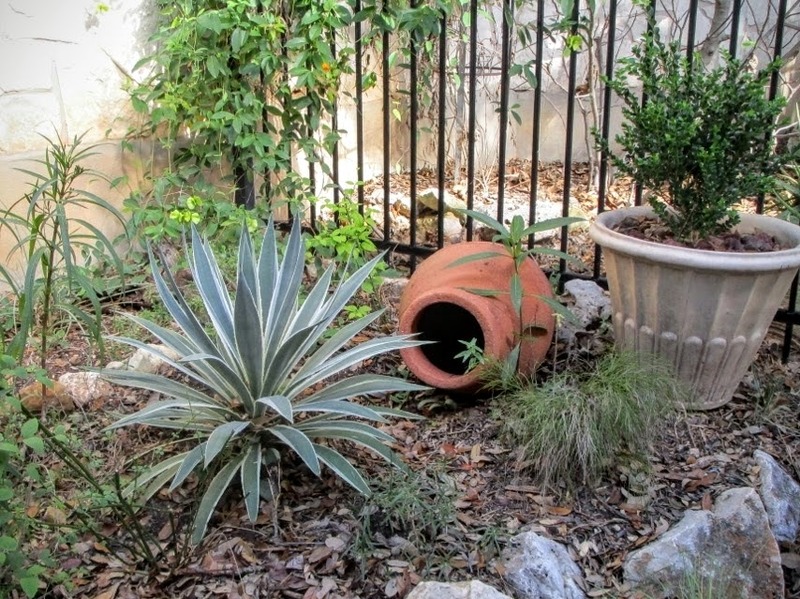 The narrow leaves in the middle belong to a small Yucca rostrata. 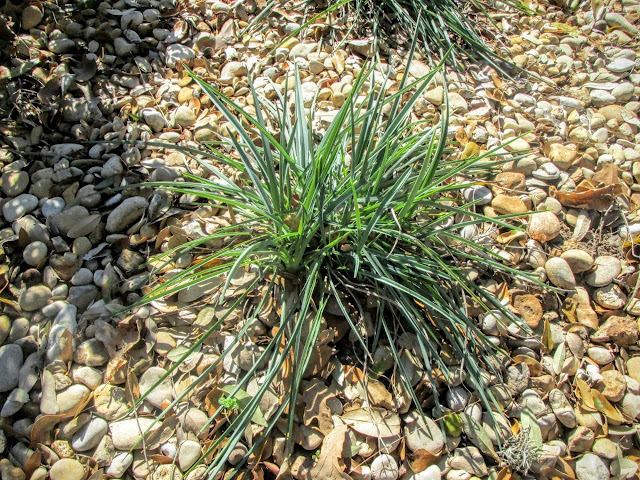 A special variety of native Yucca rupicola features gold-edged silvery leaves. 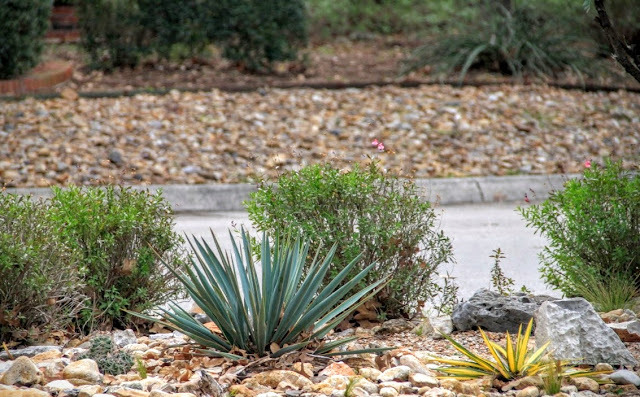 Color Guard Yucca in the right foreground picks up the the gold and green theme against a background of native Salvia greggii. 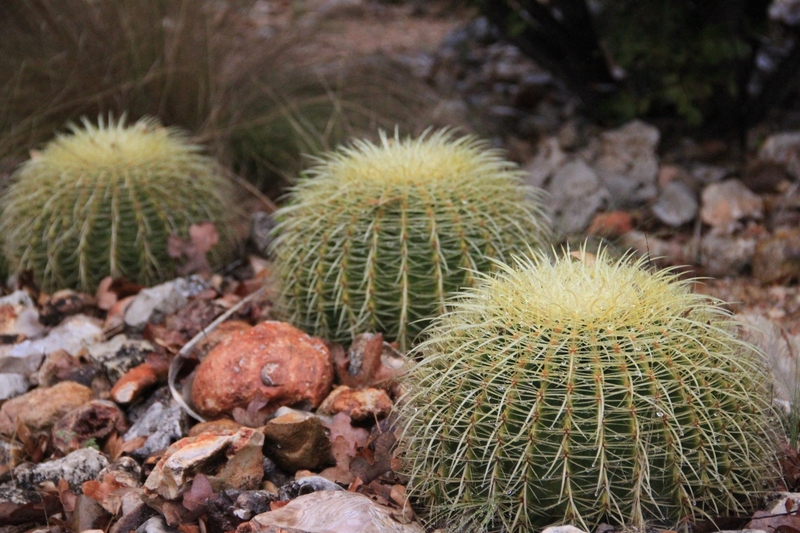 Golden Barrel cactus (foreground) needs little care to look its best in this tough spot along the driveway. And here they are close up. 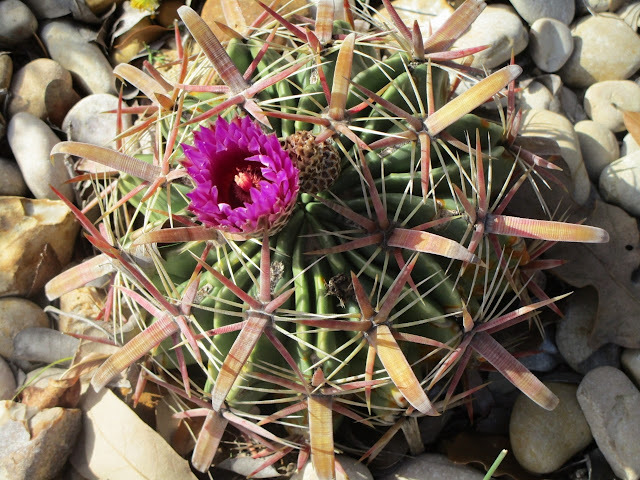 Fishhook barrel cactus continues to produce bright magenta blooms during our mild winter. 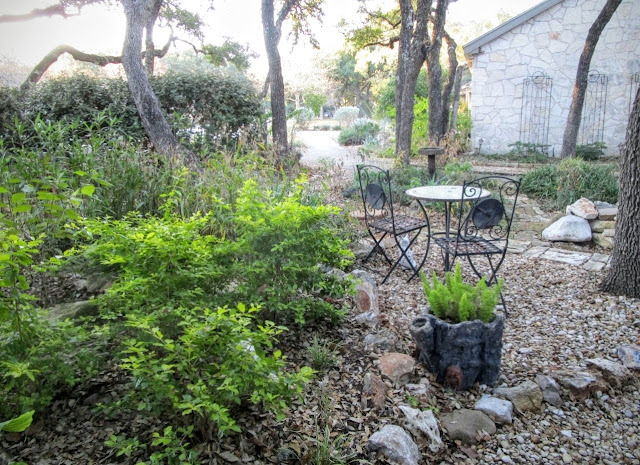 Another welcoming garden near the front walk is in the works. 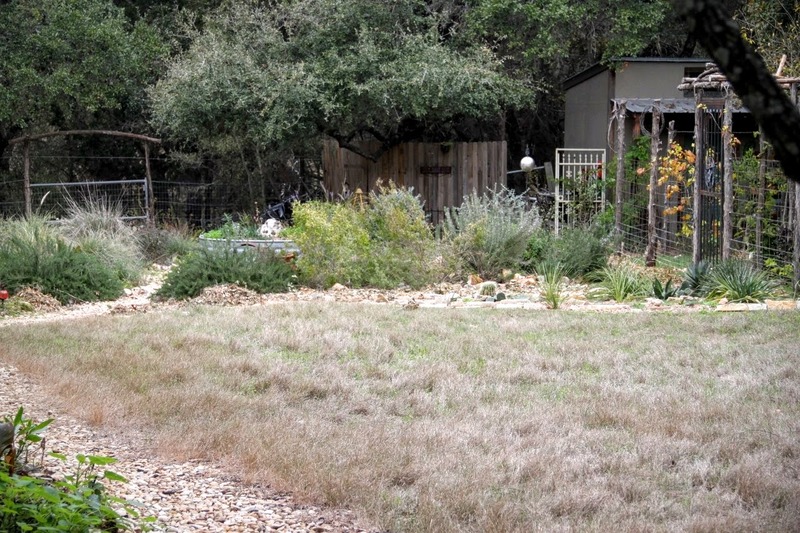 Deer resistant Wooly Stemodia will eventually make a silvery carpet for small agaves placed here. Agave Victoria-reginae grows slowly so it's a great choice for small spaces. 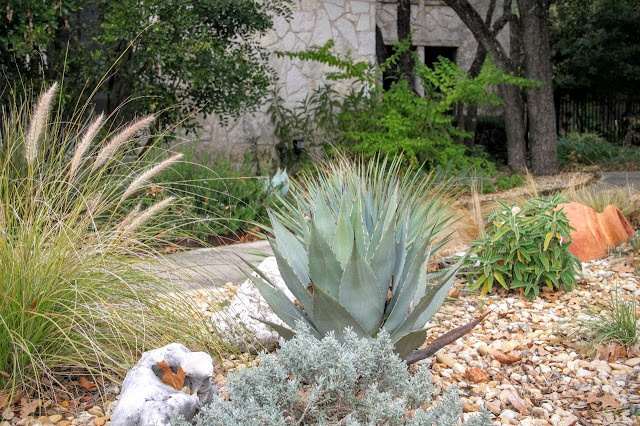 Opuntia Santa-Rita and Color Guard Yucca add winter color on the north side of the driveway. 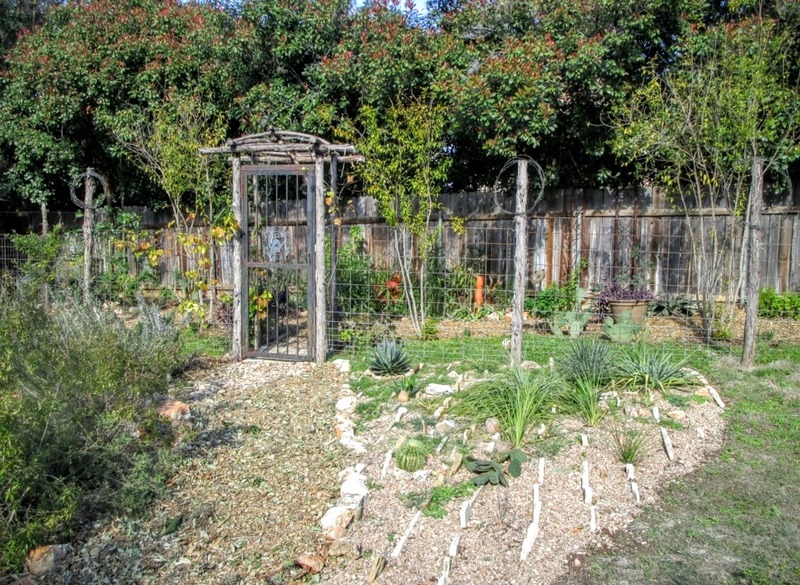 Around back the crevice garden holds a sunny slope where little would grow previously. 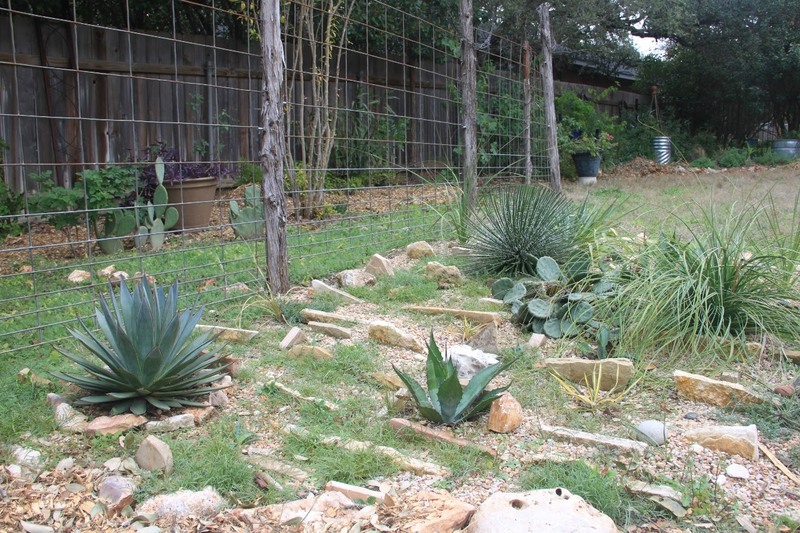 It's a perfect spot for more small agaves, grass-like nolina, yucca, and cacti nestled into pea gravel. 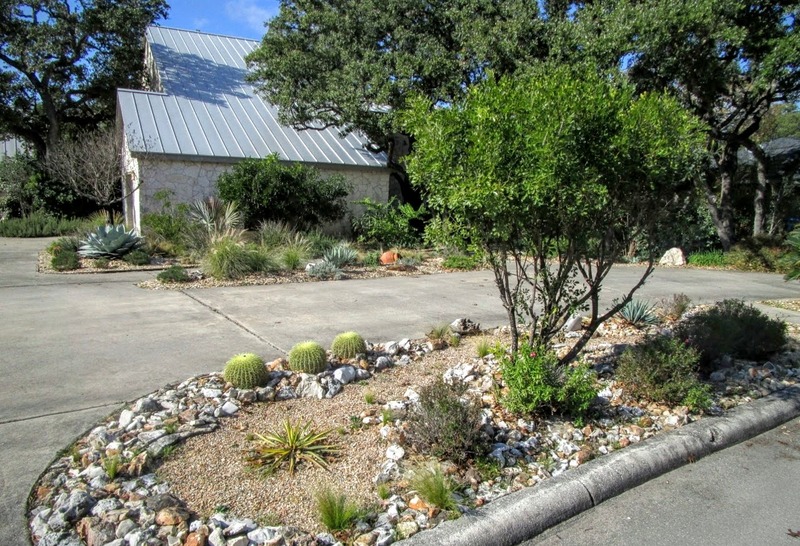 By the way, those low-growing green plants in the gravel are wildflowers, not weeds. My favorite here is Agave 'Blue Glow' in the left hand corner (above). 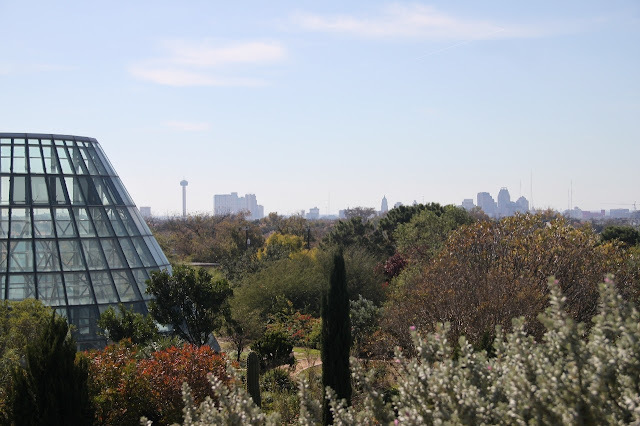 Below it's shown with a backdrop of Texas Blubonnets from last spring. 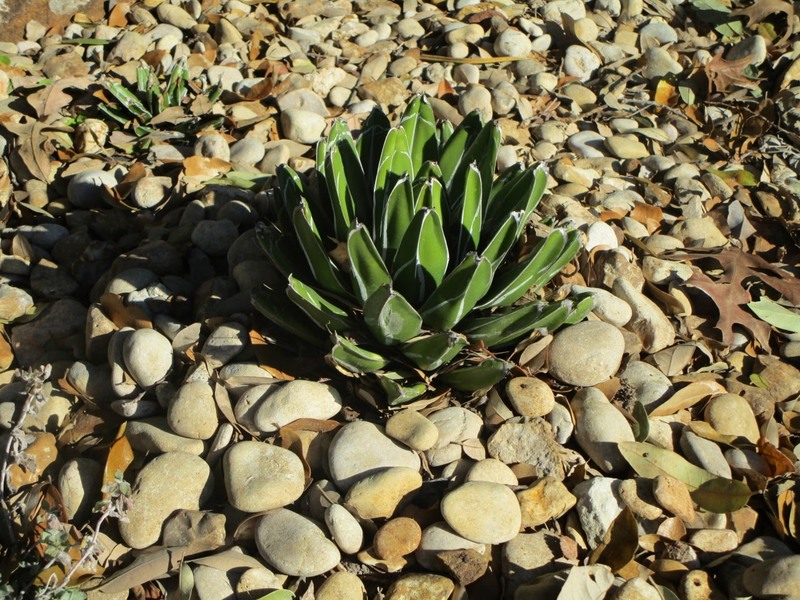 Agave angustifolia picks up the silvery theme in the narrow side yard. 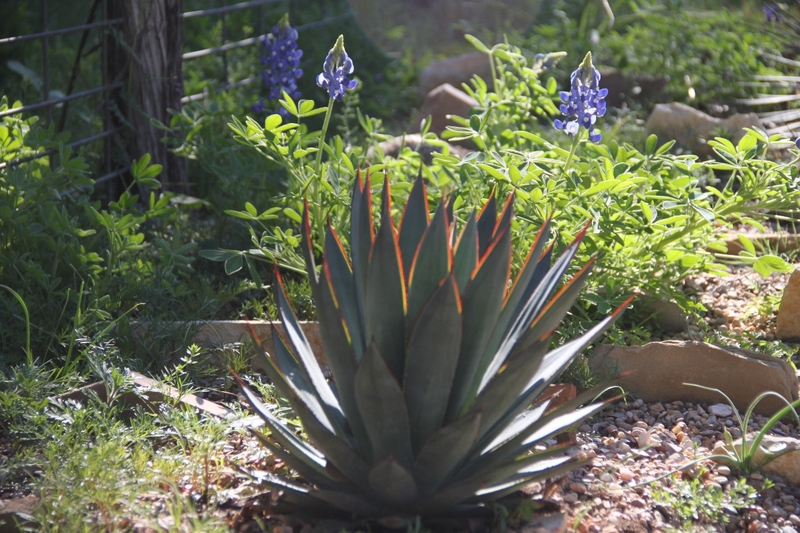 Agaves, cacti, and succulents keep my garden looking its best year round. I'll have an opportunity to write more posts for Garden Style San Antonio this year and I'm looking forward to sharing my San Antonio garden adventures with you. Be sure enter your email on the front page of the Garden Style San Antonio site to keep up with the best of San Antonio gardening. Mild winters in South Texas allow for working in the garden most days. In fact, winter is the best time for big projects because soon enough it will be too hot to do much of anything out there. 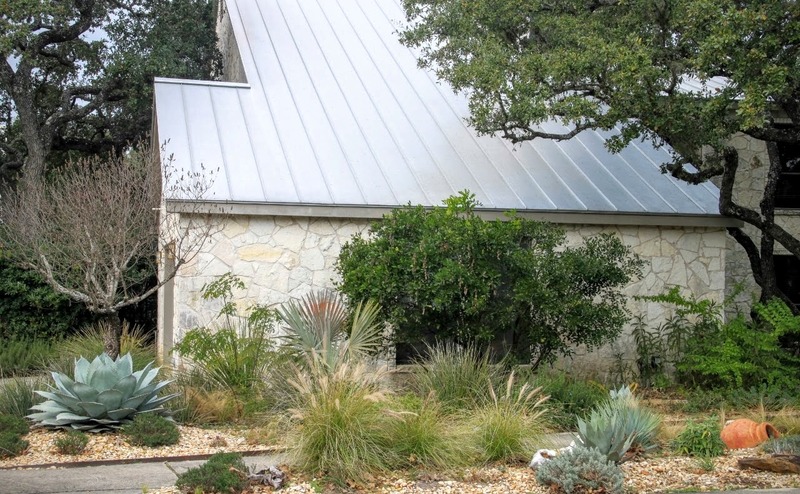 Midwinter is a great time to take stock and begin spring preparations. With longer, warmer days just ahead, I'm taking you along on a tour as I figure out what needs to be done. Let's see what's working, or not. 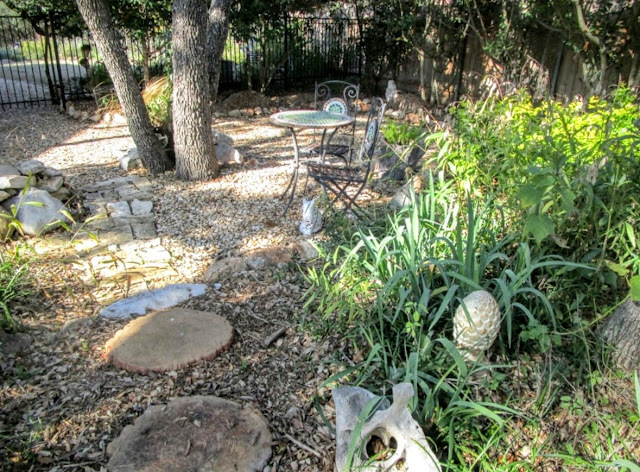 There's only a little work to do in the front garden this year and that's by design. 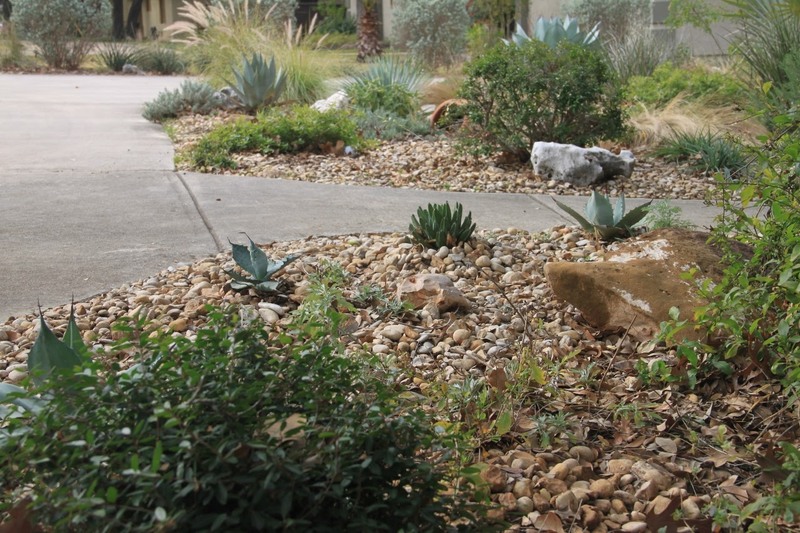 We planned for low maintenance and the same look year round. Yes, that's a lot of concrete! Out at the end of the driveway, three beautiful Yucca 'Color Guard' plants died after blooming last spring and Agave lophantha 'Splendida' offsets were planted as a quick (free) replacement. The agaves are the green, spiky plants behind dormant Salvia greggii. 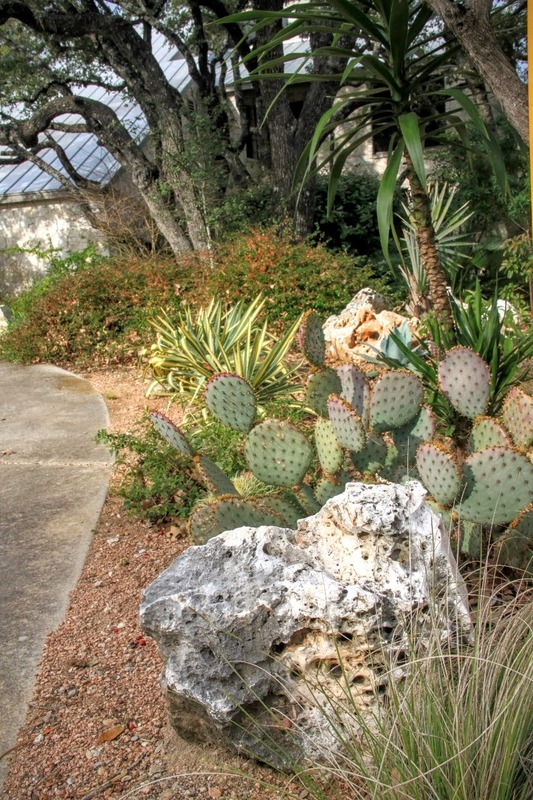 I miss the bright yellow accent provided by the yuccas. 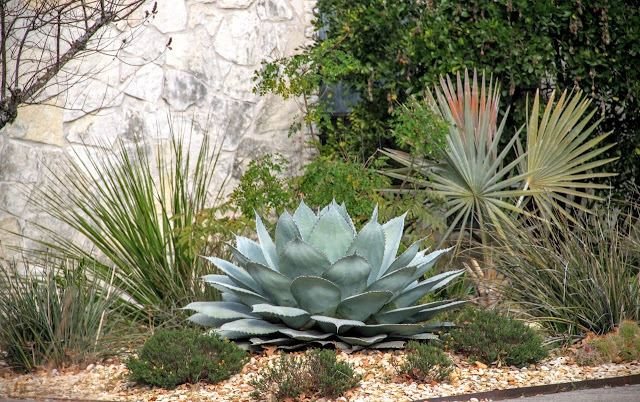 Instead of more short-lived yuccas, I'll plant Agave shidigera 'Shira itoh no ohi'. 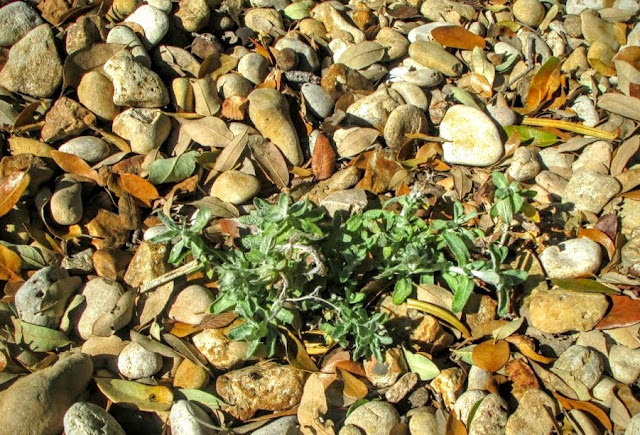 A cold hardy, full sun plant that rarely offsets and promises to stay put for 10-25 years is just what I'm looking for here. I have one, just need to find two more. 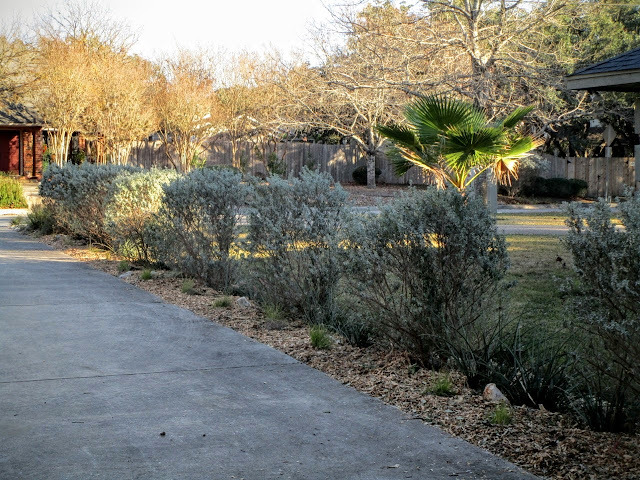 Freshly mulched driveway bed all ready for spring. Ruby Crystals (Melinus nerviglumis) grass replaced Mexican Feather Grass (Nasella tenuissima) at the base of the Silverado Texas Sage last fall. Mexican Feather Grass spends too much time in a brown, dormant stage for me. 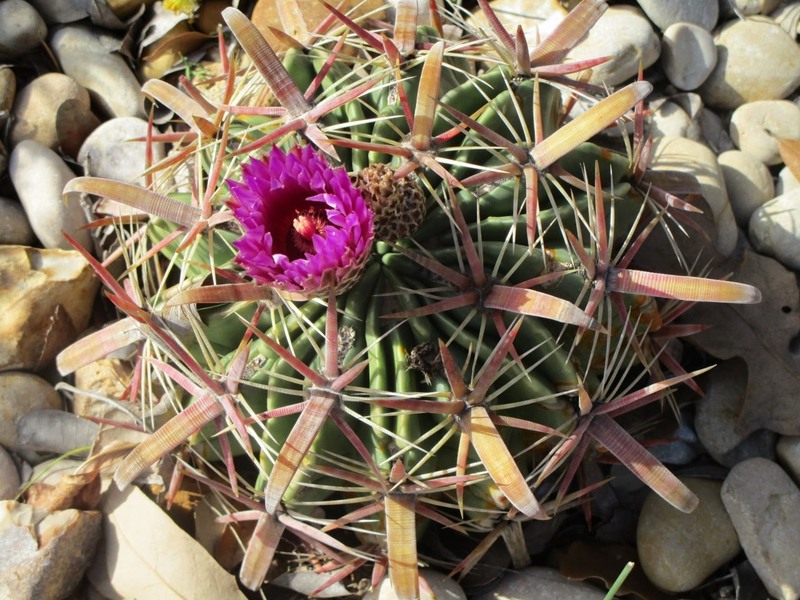 Ruby Crystals has stayed green so far this winter and is even blooming in spots. A prolific reseeder, Ruby Crystals should spread quickly to soften driveway edges and it requires very little water to look good year round. 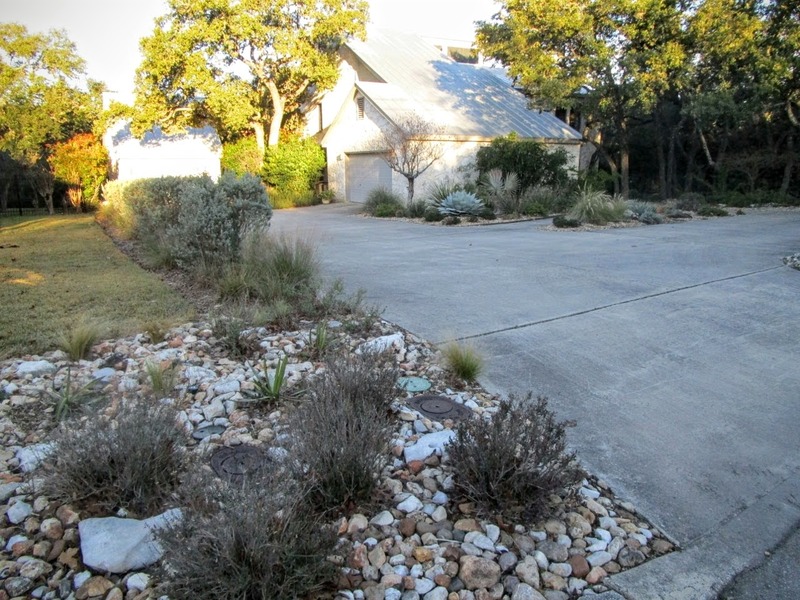 Pennisetum grasses with seedheads provide winter interest in the driveway island. These were entirely free of charge since the seeds blew down from my neighbor's garden several years ago and I've been transplanting seedlings ever since. 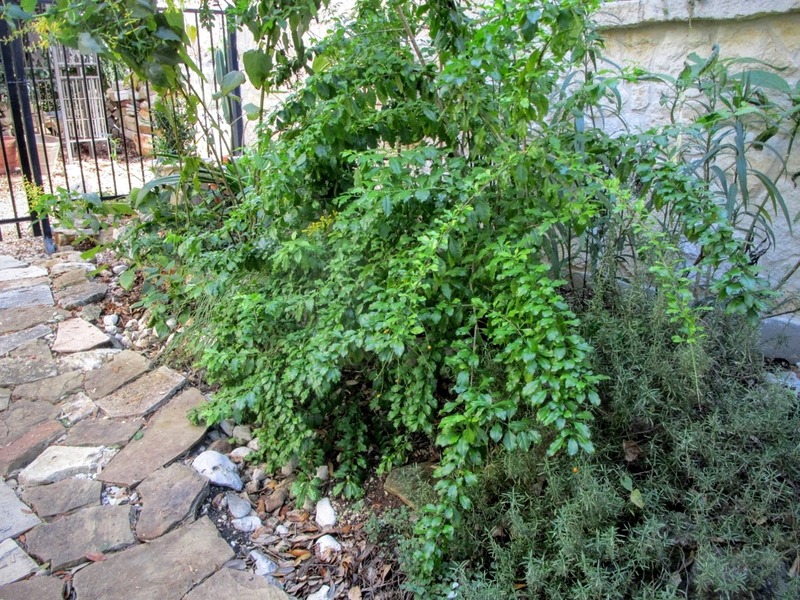 A Vitex at the corner of the garage will be removed this year. Pruned into tree form by the original owners, it looked great for about 20 years. Blooms and leaves have been sparse the last few years so it's time for it to go. As for a replacement, I'm currently shopping for a tall Yucca Rostrata that hopefully doesn't require a second mortgage! Here's a corner that definitely needs work. 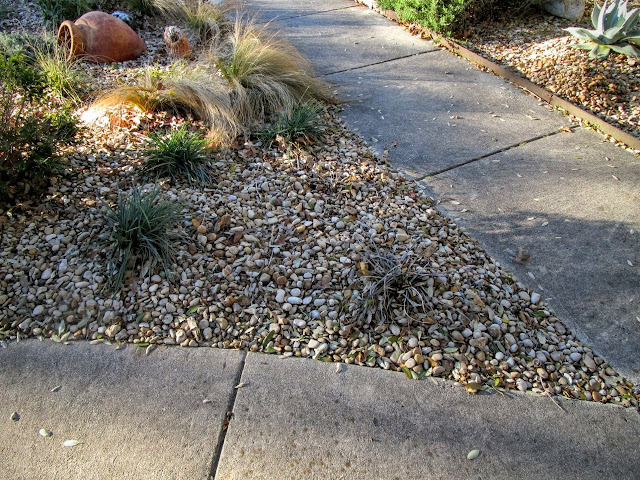 I replaced underperforming Spanish Lavender with those three grass-like Flax Lillies (Dianella 'Baby Blue') last fall. 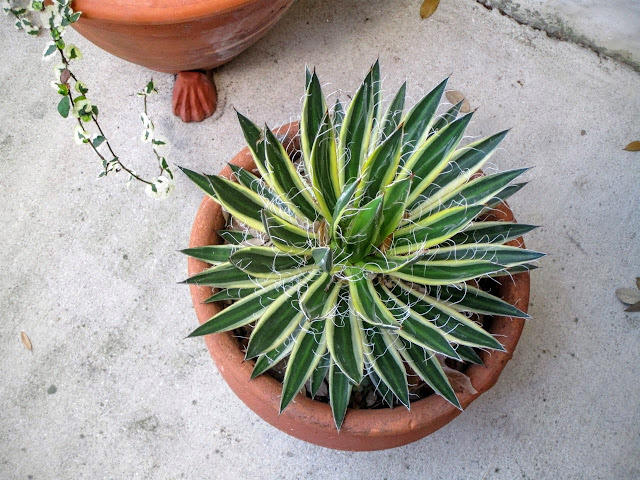 When I couldn't find enough matching plants, I added Dyckia 'Silver Nickel' in the triangle end. But it was too wet for Dyckia (that sad grey plant on the right) so what's left will be potted up and, if I can't find more of the same Dianella variety, the original three will be divided. They'll be small but at least I know they work well here. Love the blue-green color of this variety of Dianella or Flax Lily which will eventually produce small blue flowers. A small agave bed along the front walk is coming along. Copying a popular idea I've seen on garden tours in Austin, my plan is for small agaves nesting within silvery ground cover. After losing the first planting of Wooly Stemodia groundcover to torrential downpours last spring, we've reworked the soil to try again with better drainage. So far, so good with the new plants surviving late fall torrential rains. Wooly Stemodia is the best choice for the look I want since deer avoid it while devouring similar options. 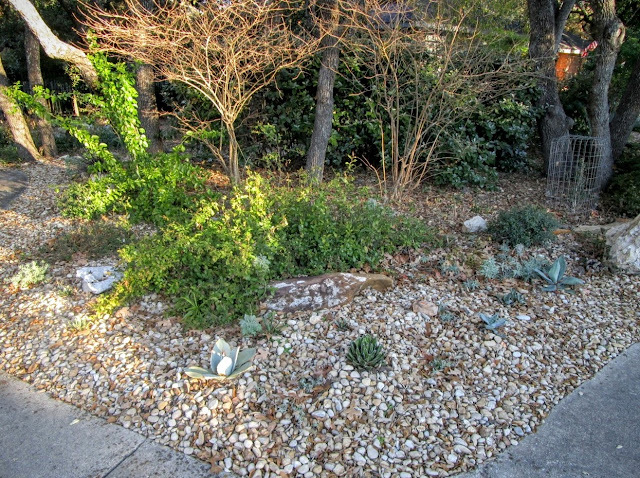 It still looks sparse so I'll add a few more to get the gravel mulch covered faster. The bistro set looks a little lonely without its usual topping of potted plants. 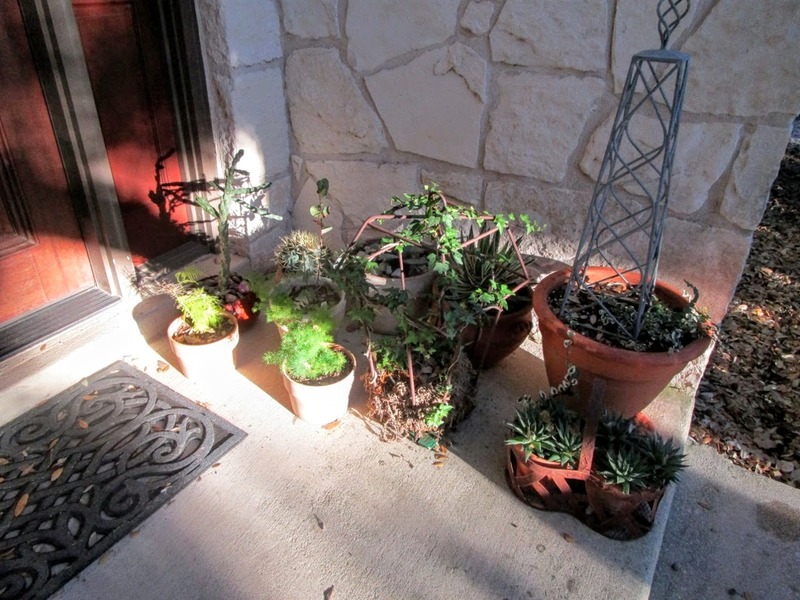 Most are cold hardy but I've moved them to the porch just in case. They'll be moved back out soon. Duranta 'Gold Mound' usually dies back so I'm enjoying its bright color during this warm winter. 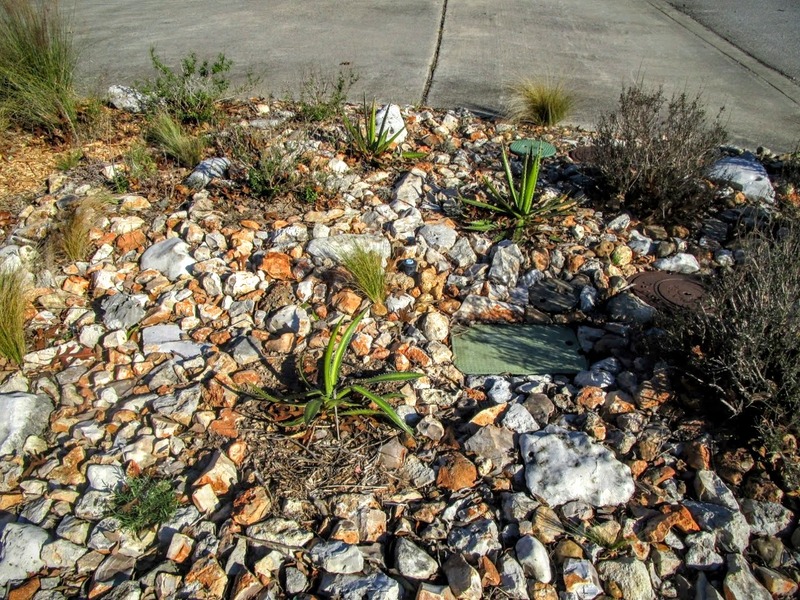 Not much to do here since last fall I added a few variegated Liriope to fill in along rock edging. Now looking through the gate, evergreen Rosemary provides spots of deep green in the circle garden. We expanded the crevice garden last fall for more places to plant sun-loving cacti and succulents on a slope where nothing else would grow. As some of my favorite plants offset, I'll add them here. 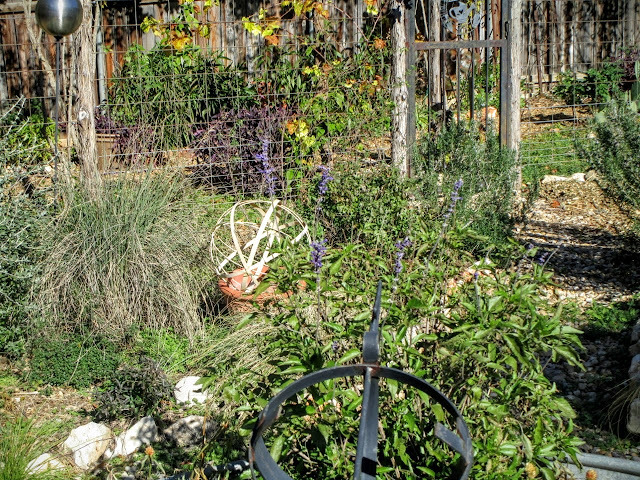 Perennials await cutting back in early March. I usually wait until then in order to protect new growth from late freezes and provide winter cover for birds and insects. We've even got a few blooms on Henry Deulberg salvia. Over the south fence, I see more work to do! The dry creek needs clearing out and sedges along the walk should be divided. Still I am reminded this area has come a long way over the last couple years. Duranta 'Sapphire Showers' has grown massive and will either be transplanted or removed so the entire bed can be reworked. I love the delicate blue flowers but it's not a spectacular plant in any other sense especially when it overwhelms the narrow space. Now I have my work planned, I just need to get it all done! Sunrise, Sunset, is the mulch finished yet?